Many of us like to enjoy the warm weather of summer but, when enjoying it with our dogs, there are things we need to do to keep our dogs safe. When traveling with your dog, use either a crash-tested seatbelt harness or a secured crate in the back-seat area because, inside your vehicle, unrestrained dogs can be a hazard to themselves and to others. A deployed airbag can seriously injure a dog and a frightened loose dog may bolt from an accident scene. In some areas, having an unrestrained dog in a vehicle can negate the driver’s insurance. Dogs should never be transported in the open bed of a truck. Even restrained in the back of a truck with a leash, dogs can be hanged. They are also exposed to the elements risking hypothermia, heatstroke, and injuries to the eyes and ears. In many areas, it is against the law. Dogs should be well-trained before earning off-leash privileges and, even with well-trained dogs, owners should look out for hazards like unmarked cliffs and wildlife. Wildlife can also pose a threat to dogs (and dogs to wildlife) so be prepared to avoid interactions especially if the wildlife have offspring to protect. Other local hazards are some species of plants, insects and parasites. Standing water can harbor infectious agents and there are many diseases dogs can acquire from standing water (some of which are transmissible to humans). Dogs can ingest too much water resulting in a relatively rare condition called “water toxemia”. This can happen when dogs are retrieving balls in water, or when they have been exercising and consume a great amount of water after exercise resulting in their sodium levels being diluted to dangerously low levels. Water toxemia is often fatal and any dog showing symptoms need to be seen by a vet immediately. Symptoms of water toxicity can include loss of coordination, lethargy, bloating, vomiting, glazed eyes, light gum color, and excessive salivation. Heat is an issue for dogs (who have few sweat glands and must pant to cool down). Every year warnings go out about the dangers of leaving a dog in a hot vehicle and, sadly, dogs still die in hot vehicles. A car stopped in hot weather can quickly magnify outside temperatures and leaving the windows opened slightly does not significantly slow the heating process nor decrease the maximum temperature inside. Studies indicate that, even with relatively cool ambient temperatures, the rise in temperature inside vehicles is significant on clear, sunny days and rises most within the first 15 to 30 minutes. In hot weather, pavement can get very hot. The pads of the dog’s feet can burn and blister on hot pavement. Additionally, dogs are close to the ground and they can get much hotter than we do so keep away from pavement. Be cautious when hiking with your dog in warm weather. Every year, dogs who hike on hot days succumb to heatstroke. Ensure you take lots of water for the dog and that the hike is not too strenuous for the dog. Monitor play. A dog playing outside about mid-morning only survived heats stroke after intensive veterinary. The outside temperature in the location where the dog played was reported to be 29 degrees Celsius but the core body temperature of the dog when he got to the vet was measured at 42 degrees Celsius (normal body temperature is 38.5 degrees). Heatstroke is an emergency and requires immediate removal from the heat and transport to a veterinary hospital. Symptoms include skin that is hot to the touch, increased panting and salivation. As the condition worsens the dog can have multi-organ failure and the symptoms can progress to vomiting, diarrhea, loss of coordination, collapse, and unconsciousness. To avoid heat stroke, only exercise dogs when or where it is cool. 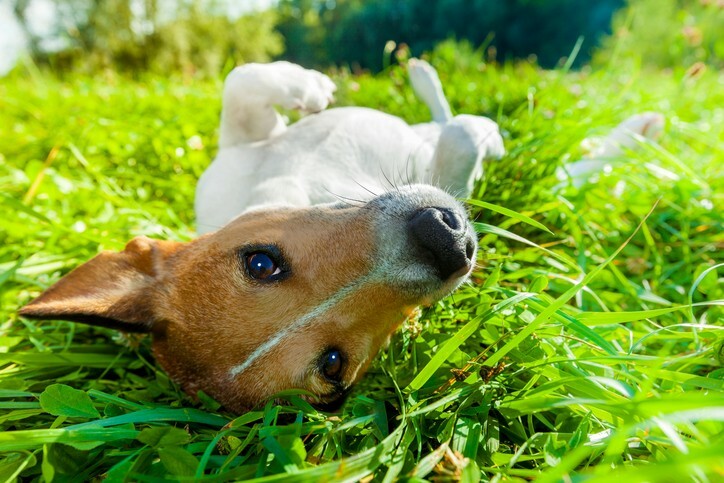 Dogs should always have access to shade and to drinking water and should not be confined to an asphalt or concrete surface. Utilize equipment and products that cool dogs down. Avoid using muzzles that inhibit the ability of the dog to pant. Have fun in the warmer weather but stay safe!